This is an exhibition catalog for Self-Determination Inside/Out, and exhibition about prison movements held in the Fall of 2014 at Interference Archive. A comprehensive exhibition and public program series featuring the cultural materials produced by incarcerated people and their allies. Ranging from the Attica Rebellion to political prisoners, AIDS education to prisoners-as-laborers, the struggles of incarcerated women and queer people to the current wave of hunger strikes in prisons and detention centers across the country, these materials fundamentally recast the history of the prison-industrial complex. The exhibition shows incarcerated people not simply as the objects of state repression or social justice activism, but as active initiators and leaders in the critique of “criminal justice”—and other forms of injustice—in the U.S. 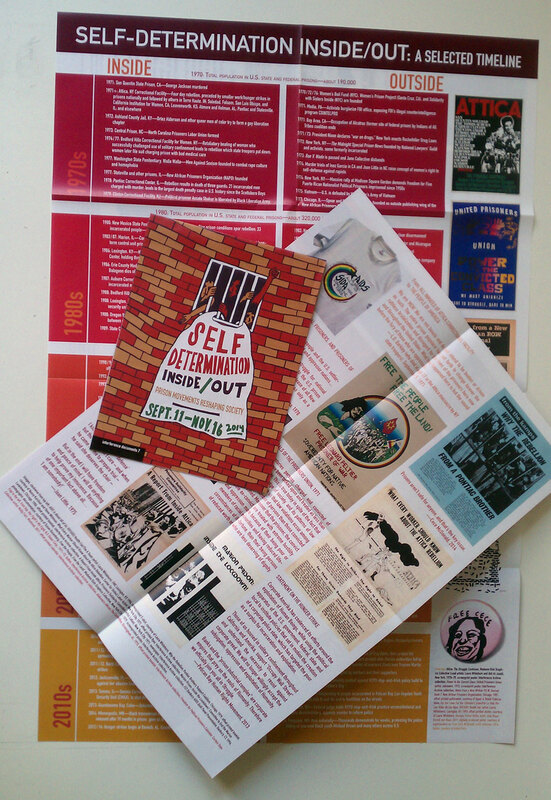 The catalog contains a statement from the exhibition organizers (Molly Fair, Josh MacPhee, Anika Paris, Laura Whitehorn, and Ryan Wong), quotations from incarcerated people about their movements, full-color reproductions of posters, pamphlets, buttons, and t-shirts, as well as a poster-sized (20″x30″) timeline of the history of movements and activism in prisons from Attica in 1971 through the hunger strikes of the past couple years. This is an important document of the culture produced by a major social movement in the United States which has largely been made invisible both by mainstream society an the broader Left.